When can tortoises go outside? All tortoises can and should be out in the open air during the warmer months. They all require the UV rays of the sun for their general growth and metabolic development. Even very young hatchlings should be outside, as long as they are safe and secure. Even though your tortoise is being exposed to sunlight, which helps him to produce Vitamin D3, vital for the absorption of Calcium, you should still ensure you provide plenty of Vitamin D3 and Calcium in his diet. Table of contents: When can tortoises go outside? | Is your tortoise too hot outside? 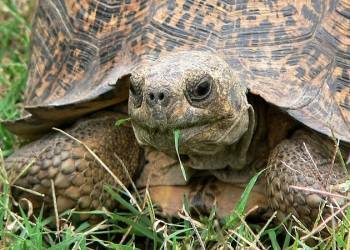 | What temperature can I put my tortoise outside? | Your tortoise's outdoor enclosure | How can I tortoise proof my garden? | What security to keep my tortoise safe? Is your Tortoise too hot outside? Due to the unusual hot weather that the UK is experiencing, you should take precautions to ensure your tortoise has plenty of shady areas to hide in. Suitable plants and vegetation as these are good for hiding in. Long grass and bushes are a good idea. Mediterranean tortoises will like Rosemary and Lavender, and Desert tortoises such as Sulcatas (also known as African Spurred) will like Pampas grass. If you don't have these plants already growing in your garden, then any plant type will do, as long as its not toxic to your tortoise. Tortoises like to borrow into the ground to keep cool in hot weather. Therefore you should dig up an area in your garden, where your tortoise can bury itself. It doesn't need to be too deep, just enough for your tortoise to get shelter, and act as it would in the wild. You can also provide a hide, buried in the bushes - paint this white to reflect the heat. You should bathe your tortoise regularly in the hot weather, to prevent dehydration. Bathing several times a week is a good idea. 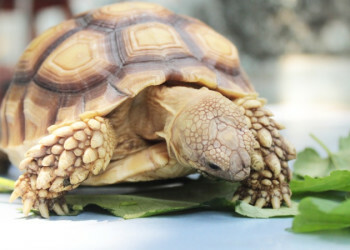 You should also provide plenty of water refreshed daily, in a dish, for your tortoise to drink. If you keep your tortoise in a shed or a greenhouse, ensure access to the outside area is available at all times. A green house can get very hot, and isn't really a good idea in extreme temperatures. Ensure that the doors are opened early in the morning, and that plenty of shade, and burrowing substrate is available. What temperature can I put my tortoise outside? According to Christal Pollock DVM, DAVBP, the best temperature for Testudo species is 26-30 degrees Celsius. The basking spot should be around 30-33 degrees Celsius. Although we're seeing these temperatures this summer, this is unusual for the UK. Therefore the outside temperature must be warm and they should not be subjected to damp, cold and windy conditions. Do not leave them out after sun down or at night. What are the best tortoise species to live outside in the UK? All species of tortoises can enjoy the open air, either singly or in social collections. Hatchlings should be kept in a small secure boxed ‘run’ with no means of escape, either over or under and must be protected with small gauge mesh to prevent predators such as foxes, dogs and birds snatching them. There must be some physical shelter from direct sunlight to prevent them from overheating. Don't forget to continue with providing your tortoise with a varied diet. Just because he's munching on grass, won't mean his dietary requirements are met. 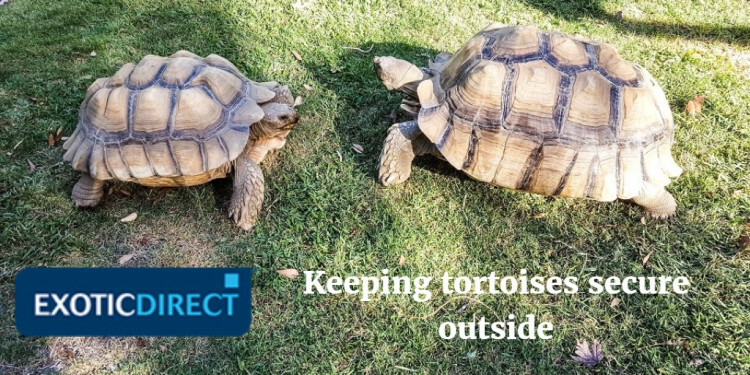 Tortoises can and are stolen to order - so although keeping your tortoise outside is the best thing for him during the summer months, ensuring he's secure is essential. You need to make sure you're using the correct security mechanisms, to not only stop but deter thieves. The external enclosure is vital for the animal’s protection. If given free-range in the garden they can become so easily lost or stolen. Tortoises should be contained in a secure environment especially during the warmer weather when they can be highly physically active with strong climbing and burrowing capabilities. A substantial ‘walled’ structure is recommended for the larger, more mature tortoises. The structure should be of substance which will prevent bulldozing out or climbing over the sides. Such materials as railway sleepers, double stacked can be used together with a steel mesh cover and an area to protect them from direct sunlight. Find out How to build an outdoor tortoise enclosure here. Do I need a tortoise run? Tortoises should have the facility of a secure run as described for their exercise and development especially if part of a family or social group. How can I tortoise proof my garden? The main objective is to deter thieves from entering the garden. You can do this using Passive Infrared Sensors (PIR’s) and movement detectors as described below which should warn of any trespassers before they get near to your tortoise. It is very difficult to protect the whole perimeter of a garden from trespassers, so consider locating the tortoise run or compound close to your house so that you can keep a close eye on your tortoise. General security plays its part but this must be combined with awareness that thefts occur and that constant vigilance is essential. You should think of the supervision in the same way as you would a baby or a small child. 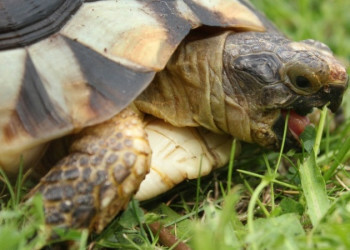 Many tortoises become stolen or lost via escape from open gardens and their security is paramount. A number of species of tortoises are subject to the CITES most endangered listings and can be quite valuable. It is vital therefore to protect the garden and the tortoises within it. Can you keep a tortoise in a shed? Many tortoises are housed in sheds overnight which should provide dry warm conditions out of any wind or drafts. In the summer your tortoise should be given access to the garden, to prevent overheating. They can be kept in open boxes with a comfortable bedding substrate. This is also ideal when the weather outside is cold and wet. Always remember to leave a shallow dish of fresh water for their drinking. A saucer is ideal for this purpose. Many tortoise owners link the shed to the external run for the tortoises to enter or exit at will when the weather is fine during the day. Another popular arrangement is the use of a greenhouse rather than a shed but beware of the temperature within during the summer months. Other common uses of the shed is for the hibernating tortoises during the winter months. You should maintain the same levels of security, as many sheds are broken into by thieves looking for tools and equipment - if they stumble across your tortoise they will take advantage of the opportunist incident and steal him. What security can I use to keep my tortoise safe? Passive infrared sensors: These measure infrared light emanating from objects in their field of view, and will pick out not only your tortoise, but any intruder. You can link the infra red beam to a dial out unit, that will alert a device of your choice, should the beam be crossed. It’s important that you install efficient security to ensure that thieves are deterred from breaking in, and stealing your pet. Importantly, photographs should also include the plastron. This should be photographed up close, to illustrate the unique markings of pigment and striations on the surface. Photographs should be signed and dated and stored in a secure place, for identification purposes should your tortoise be lost. Nothing should be used to mark your tortoise, especially not paint, nail varnish, micro-dot or U.V pen chemicals. None of these are permanent, and can lull an owner into a false sense of security. Every tortoise is unique, especially the carapace and the plastron. This is why their markings are otherwise known as ‘The Tortoise Fingerprint System’. There are a number of tortoises subject to CITES Regulations which require licences issued by DEFRA if they are entered into trade. The full list is available on the Tortoise Protection Group website. If used for breeding purposes and the offspring hatchlings are destined for sale, both the parents and the young ones require CITES Article 10 licences before being entered into trade. The parent tortoise must be microchipped at time of application and the hatchlings must be chipped when the shell/carapace has grown to a length of 10 cm, (4 inches). It is advisable that the implant of the microchip be carried out by a specialist chelonian vet. All Tortoise owners should be aware of the aforementioned BCG website which provides excellent information of security, CITES, care sheets and all Tortoise husbandry matters. John Hayward is one of the founders and the co-ordinator for the National Theft Register for Lost and Found animals. This includes dealing with Zoological investigations, Security and Risk management, Hostage Negotiation and Response Training.